Is it just me or is soap on a rope a very retro thing? I have come across a few before, but I think they've mostly been intended as a joke present. 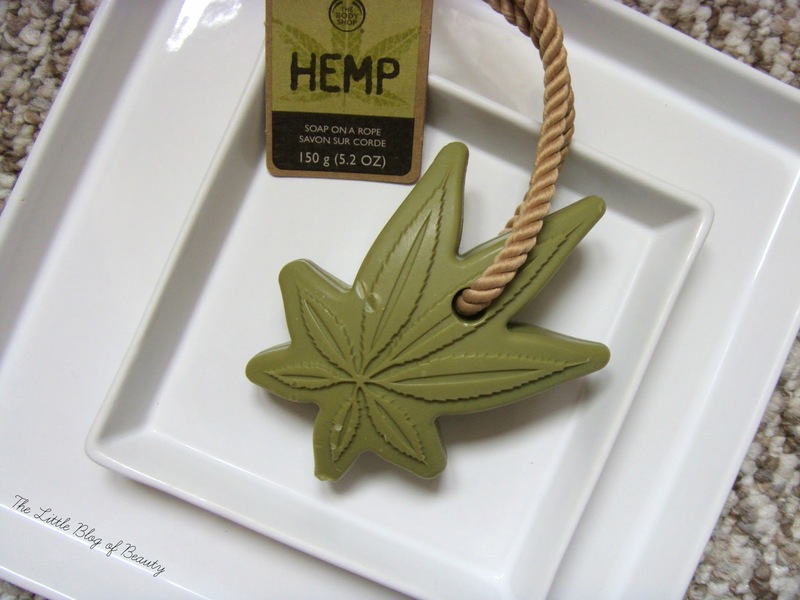 So when The Body Shop contacted me to let me know they would be sending me some new products to try out I was very surprised to see that one was a Hemp soap on a rope*. The idea behind this being on a rope is that it hang dries so it doesn't pick up dirt and bacteria sitting on the side of the bath tub, or any surface you may choose to leave it on. As the name suggests it's part of the Hemp range and contains moisturising hemp seed oil for non-drying cleansing for dry/very dry skin. I have to say if I saw this is store I would assume it was a masculine product due to the khaki green colour and thick rope, but I believe it is intended to be unisex. In fact the image TBS used to advertise this in one of their emails was an apparently naked man holding this over his, er, bits. So maybe that was TBS saying 'Hello ladies, this one's for you'! I did tweet the picture saying it's not that big (meaning the soap!) and TBS replied saying if they'd used the correct size you'd be able to see a little more than you should! Also does this remind anyone else of a cannabis leaf? There's a very slight fragrance to this but it's not very noticeable. From the look of it I thought it might be quite hard and difficult to lather up but actually it was the complete opposite. Obviously it is hard because it's a solid soap but as soon as it comes into contact with water it starts to produce a lather. Apart from the whole hanging it up to dry thing I thought there were good and bad sides to the rope. It's good to loop over your wrist so it doesn't go astray if it slips out of your hand but the rope also feels like it can get in the way slightly. Until some of the pattern has worn off (there's also a TBS logo stamped on the back) I'd recommend lathering it between your hands rather than rubbing the soap directly against your skin as it's a bit bumpy. I didn't find it particularly moisturising (I have very dry skin) but I also didn't find it at all drying. In general, although it's not the most feminine or prettiest TBS product it was nice to use. It's not a product I would personally buy, as I tend to prefer shower gels over soaps, and I'm not really sure how I feel about the rope. 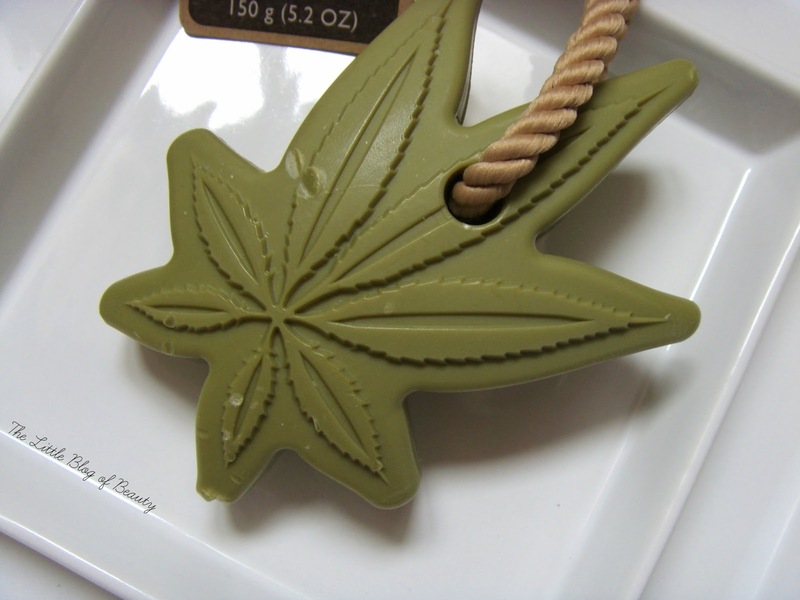 If you do like the look of the Hemp soap on a rope it's £7 and is available online and in store. How do you feel about soap on a rope? Yeah hemp is cannabis; same plant. Hemp is what is used to make rope - so it all fits.